7 Reasons Your Small Business Must Have a Back Up Solution! It is 2014, and we all know that every business should have a backup (and a recovery plan) for their most critical data. The reality is that over 40% of Small and Medium Sized Business do not back up their data at all, and that 60% of backups fail when tested! It is time for businesses to get serious about backing up their most critical data including client information, accounting files, and company information. Here are reasons why you need to make sure your data is backed up and you can quickly recover from a data loss disaster. People Make Mistakes: Humans account for 30% of all data loss; this includes accidental deletion, disgruntled employees, and spilled beverages. While human error is going to be difficult to combat, you can at least be sure you are able to revert back to an error-free version. Many times people unknowingly miss steps in a process or delete files, so having a plan in place to restore the lost information is critical to being able to run your business. Technology Equipment Fails: The equipment it takes to run your business has come a long way, but nothing is perfect and all equipment is bound to have issues or fail completely. 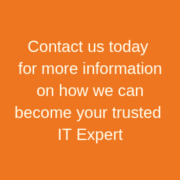 It can be expensive and nearly impossible for your company to eliminate every single point of failure in your IT infrastructure, so the best option is to back up your data regularly and have a plan in place to get the failed equipment replaced or repaired quickly. This will help to minimize the amount of downtime and revenue loss your business incurs. Mother Nature is Crazy! : Over the last few years, Mother Nature has wreaked havoc on technology systems all over the world, due to the deep freezes, extreme heats, and mass flooding that has taken place. Businesses that do not have a backup and recovery plan in place will have an uphill battle trying to resume operations in the event of a natural disaster. In fact, an estimated 80% of all companies that experience a business interruption of greater than five days, without recovery plans, go out of business. Competitive Advantage: It is a weird thought, but having a backup and recovery plan in place can actually give you an edge over your competition. In the event of a disaster, the first business to become operational again is in a unique situation to acquire all the business of those that are still recovering and not able to meet the needs of demanding customers. Theft: Theft can impact a data loss in a multitude of way including hackers scraping client information or an employee’s company laptop or mobile device being stolen. Educating employees on Internet safe practice will help safe guard your business against viruses and hackers, but if a device is physically stolen it becomes more difficult. Having a backup will help get the employee back to work quickly, and with the growing number of Mobile Device Management solutions you may have the ability to virtual erase all of the most confidential data from the stolen device remotely. Compliance Regulations: Many Professions and businesses are required by law to have a backup and recovery plan in place, if you are unsure what is required by your industry you need to investigate right aware. Many times if you are audited and out of compliance it can lead to hefty fines and penalties, that cost much more than just establishing a backup and recovery plan in the first place. We understand that it is human nature to believe that you will never be impacted by one these statistics, unless you have been through a data loss or had your device stolen. Data loss comes in all shapes and sizes, and without a backup and recovery plan in place your business will face problems at some point! So we challenge you to think about how much money you are losing every time a server or desktops fails and your employees cannot work, or you clients cannot complete purchases. Putting a proactive backup and recovery plan in place today will save you time and money later when disaster does strikes! https://computertroubleshooters.co.uk/wp-content/uploads/2018/11/computer-troubleshooters-3.png 0 0 briancraigie https://computertroubleshooters.co.uk/wp-content/uploads/2018/11/computer-troubleshooters-3.png briancraigie2014-05-16 13:08:052014-06-11 03:33:577 Reasons Your Small Business Must Have a Back Up Solution! What is your computer doing during YOUR holiday? Data Backup is More Important Than Ever What is your computer doing during YOUR holiday?